The navigation links at the top of the eBay home page list six top-level eBay links that take you directly to different eBay areas through drop-down menus. You can also click the Cart link to view your cart before payment. Using the navigation area is a one-stop click zone. You can find this area at the top of every page you visit on eBay. No matter where you are on the site, you go straight to a related page when you click one of the six navigation links. Think of links as expressways to specific destinations. Click a link just once, and the next thing you know, you’re right where you want to be. Daily Deals: Featured items and deals that are good for the day in many categories. My eBay: Clicking the top-level link, My eBay, may bring you to different places depending on how long you’ve been on eBay. If you are new to the site, it will bring you to your personal My eBay transactions page. This is where you will keep track of all your buying and selling activities and account information. If you’ve been selling on the site for a while, and are subscribed to the Selling Manager or Selling Manager Pro products, clicking this link will take you to those pages. Summary: Clicking here takes you to your eBay Summary page. Your Summary page is very similar to the My eBay page; your Watch List and purchases are featured at the top. Bids/Offers: Clicking here takes you to a page that tracks any bids you’ve placed on items up for auction. It also shows any listing in which you’ve placed an offer. Watch List: On every eBay item, there is a link to watch an item. It gives you an opportunity to bookmark an item for possible future purchase, or to keep an eye on bidding in an auction. Any item you’ve marked as such will be listed on this page. All Lists: This page duplicates the listing of items you are watching, along with any other lists you’ve set up. 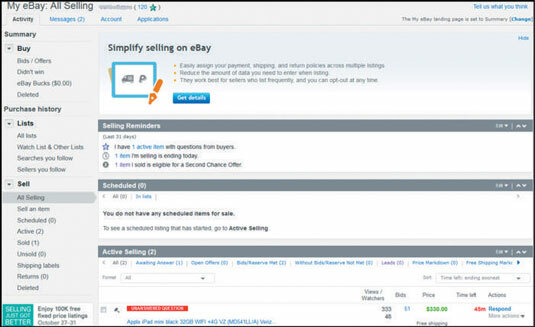 Purchase History: If you’ve been buying items on eBay, the site has kept an online record of every purchase you make there. Going to this page allows you to view all your purchases as far back as three years ago. Selling: Here you’ll find an interactive list of all the items you currently have up for sale on eBay. 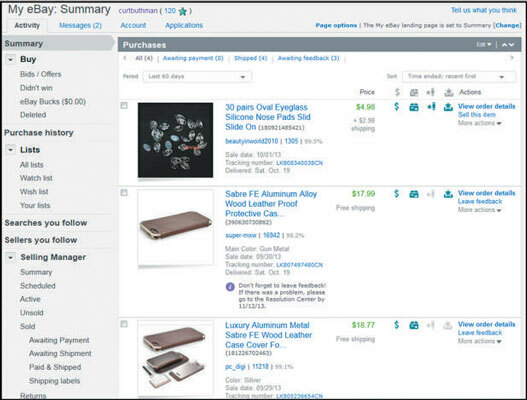 Followed Searches: If you have many different things you search for, eBay gives you a tool to save a certain search you make. On this page you can view or edit or add product searches. Messages: Click this link and you’ll be brought to the eBay message area (also accessible from the tabs at the top of your My eBay page). When someone wants to contact you in relation to an eBay item, their messages will appear here. You’ll also find messages from eBay — which it also sends to your registered eBay e-mail address. This is eBay’s private e-mail system, where you reply without exposing your personal e-mail address. During a transaction is the only time e-mail addresses are exchanged. Sell: Takes you to the start of the Sell Your Item form, which you must fill out to start your sale. Community: The drop-down menu you’ll find here gives you four options. Clicking the various options takes you to pages where you can find the latest eBay news and announcements (eBay changes things twice a year and posts notices so sellers can keep up to date), ask questions of fellow sellers in the eBay community, try new features, and find out more about eBay. Customer Support: A quick and valuable support page appears when you click the Customer Support link. Here you can find answers to many of your questions, as well as keep apprised of eBay’s rules and regulations that govern trading on the site. You will also find a link to the Resolution Center where you can solve many a problem with a trading partner. Notification Bell: If you have eBay messages or a notification from eBay, you’ll be able to see them here. eBay Logo: Click the eBay logo and it takes you right back to the home page. Use this link from any other page when you need to get back to the home page right away. Sign In orRegister: When you’re signed in to eBay, you will see a greeting. Click the down arrow next to your name to sign in or out.